took place at Bdjobs.com Board room on 14th May, 2018. We do things, one at a time. We work, research, work and research till we find the end of the problem…. To be the most sought-after IT & ITS solution provider in Bangladesh. We started our journey in the year 2010 to introduce Mobile based automatic emergency credit card, Swosti for the poor and underprivileged of the society. We partnered with DSK (Dushtha Shasthya Kendra) for lending and DBBL for mobile banking platform, Rocket. After initial piloting of the application, the program was launched on September 4, 2013 by Dr. Atiur Rahman, the then BB Governor. PKSF Chairman Dr. Qazi Kholiquzzaman Ahmad was the Chief Guest to the program. 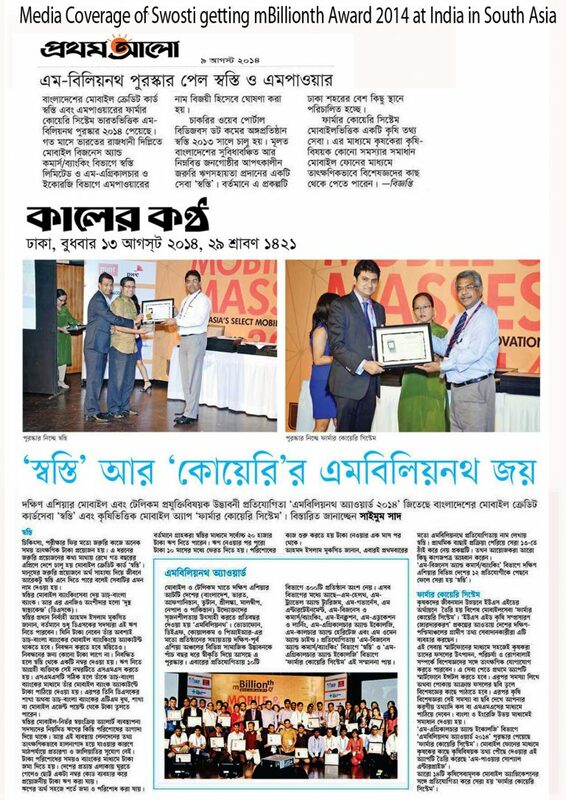 This concept of mobile based emergency credit application received mBillionth Award-2014 from New Delhi, India. Swosti Limited is an offshoot of Bdjobs.com, the first & largest career management portal of the country. Bdjobs.com started in July, 2000 by 08 young IBA (DU) Graduates with strong Business & IT background. Chairman of Bdjobs.com is also the CEO of Swosti. In 2014, SEEK International, a $5.5 billion company from Australia with global presence in 13 countries invested in Bdjobs.com with a valuation of BDT300cr. in 2017; highest valuation for any IT company in Bangladesh. Access to credit especially during the time of emergency is a critical need for any human being. With the need approaching, people tries to mitigate this emergency fund requirements through different methods including costly borrowing from unscrupulous money lenders. Bdjobs.com Management through its long experience in the IT and ITS services thought of introducing ITS to support this emergency credit needs of underprivileged people of Bangladesh. It introduced Mobile based emergency credit system ‘Swosti- Mobile Credit Card (MCC)’. Credit range was in between BDT3,000 ~ BDT10,000; which can be sought with a simple sms push from the beneficiary member mobile and the money is available instantly through Mobile Banking Agents or ATM Booths. This money was a great respite to mitigate emergency situations like medical, child school fee, special family occasion etc. for the underprivileged people having no access to conventional banking system. This concept of emergency loan through Mobile received ‘mBillionth Award-2014’ from New Delhi, India. 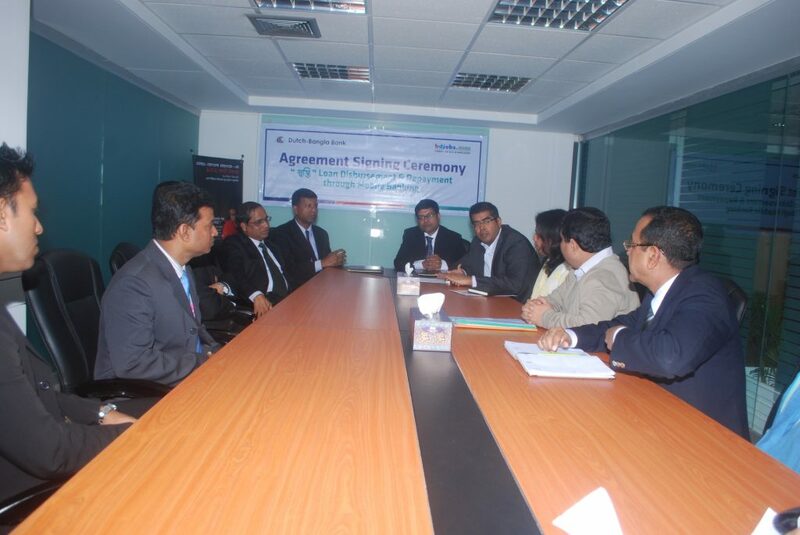 Signing ceremony with Dutch-Bangla Bank to roll-out 'Swosti-MCC' for the underprivileged. Swosti partnered with DSK (Dushtha Shasthya Kendra), a national NGO and Micro Finance Institution (MFI) to rollout the MCC among its beneficiary members using DBBL Mobile Banking Platform, Rocket. 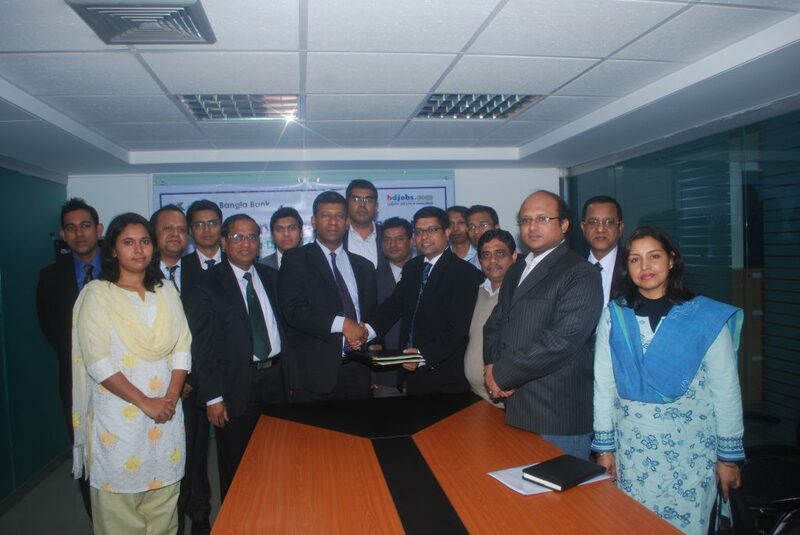 Swosti – MCC was launched on September 4, 2013 by Dr. Atiur Rahman, Bangladesh Bank Governor where Dr. Qazi Kholiquzzaman Ahmad, PKSF Chairman was the special guest. The concept of Swosti-Emergency Loan brought much vibration and appreciation in the local market and local media published the launching news with due prominence. Swosti – MCC received prestigious mBillionth Award – 2014 for its innovative approach to a conventional stumbling block of getting credit by the underprivileged people of the society. Backed by knowledge in IT & ITS enabled services specially in Mobile technology and Micro-credit domain, Swosti Ltd. introduced 1st Mobile/TAB based paperless Micro credit Management application in December, 2014. This application made tenuous loan & savings collection & withdrawal activities a fun, in a much simpler and easier way for the Credit Officer / Field Officer of an MFI. It does not engage any data entry operator or Accountant in a MFI branch. Manual record keeping gets drastically reduced. This reduces time and effort needed by MFI staff. Ultimately it benefits MFI by reducing operational cost through less stationery, printing, human engagement. Now, we are an organization with a mission to improvise MFIs to their loan activities to alleviate poverty through our mobile and web application. With the help of MFI’s and by leveraging the internet and a worldwide network, Swosti lets individuals lend money to help create limitless opportunities across the country.